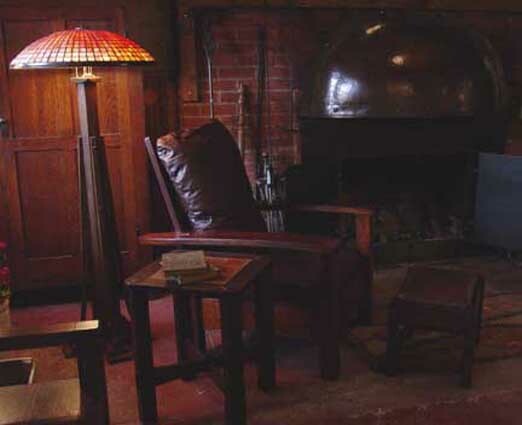 Custom Builders of Arts and Crafts Furniture-Clay Tiles-Stained Glass-in the Mission Styles of Stickley, Limbert, Green and Green, Mackintosh and Roycroft. We would like to welcome you to Black River's storefront on the internet. We have been handcrafting mission furniture since 1985 using both traditional and modern methods to bring the finest possible pieces to light. Every step in the process of making furniture, from selection of the wood to the final finish detailing is accomplished right here, in our workshop. No piece leaves our workshop until every foreseeable detail has been addressed, and our exacting standards of workmanship have been met. We invite you to look at all of our pieces in these pages. We would however like to stress that custom work has always been our forte. We strive to build furniture for each and every client to their special taste. Never think that any detail can be too small, or any job too large for we here at Black River to accomplish.